The Teen Ministry is devoted to helping the students in our church to achieve a strong relationship with God and one another. The desire of the teens is to develop strong relationships with one another, enhance personal spiritual growth, participate in a variety of fun activities, while being an example to the world around us. We are excited to announce Mark and Jami Johnson are our Teen Shepherding Couple. Our focus has been shifting from a youth only ministry to a family ministry where we focus on the family structure as the primary means of spiritual development. Congrats Alexa on getting baptised! The Teens will be studying the following books in their lessons over the next couple of months. 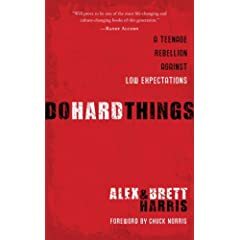 Do Hard Things is easy to read, but it will challenge you to the core. It is inspiring, insightful, and practical. Parents, this book will get your teens into the right kind of trouble — the kind that comes when they dream, take risks for God, and dare to flout the status quo. Put it in their hands. Read it yourself. It's never too late to do hard things. This book is a refreshing wake up call to our generation. We can do hard things; and give ourselves to something huge for the Kingdom of God!